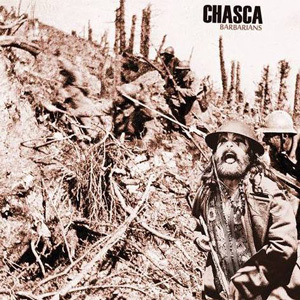 June 30, 2015 - San Marcos, TX San Marcos based glam/prog group CHASCA releases their EP Barbarians today, June 30, 2015. Barbarians is the second consecutive CHASCA EP produced by Grammy nominated Frenchie Smith (...Trail of Dead, Meat Puppets, Toadies) and sonically builds upon 2013's Bedtime for Bedlamites. Barbarians includes 4 originals and a freight train driven take on the Crosby, Stills, and Nash classic, "Carry On." The EP features a mini space opera, "The Stareater Saga Chapter III: Kruella Retooled," which takes you down a perverted cosmic wormhole and brings to life the character CHASCA has written and sung about for years. For more information, you can listen to Chasca's interview with KLBJ's Loris Lowe on Local Licks or Laurie Gallardo's Austin Music Minute on KUTX 98.9FM. Barbarians is available online today at TheConnextion.com/Chasca, as well as terrestrial outlets Waterloo Records (Austin) and Superfly's (San Marcos). Look for Barbarians soon on iTunes, CDBaby, Amazon, and other popular online outlets.